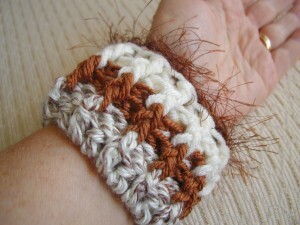 This textured wrist cuff is a quick and easy pattern to crochet. You can mix and match different colors of yarn and finish it off with a little eyelash yarn for a fringe effect. You will have to know the Front Post Double Crochet (fpdc) and Back Post Double Crochet (bpdc). It is a good pattern to use up your scrap yarn. 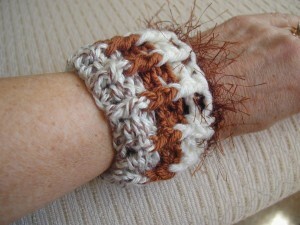 You can make matching cuffs or just one for a bracelet accent. They are very comfortable to wear! Finished Size: 2 3/4″ (6.9 cm) wide by approximately 7″ (17.7 cm) circumference. Note – this wrist cuff will fit a small to medium wrist. Instructions for the larger size are in parentheses. With color A, ch 24 (26), join with sl st in first ch made to form a ring. Be careful not to twist chain. 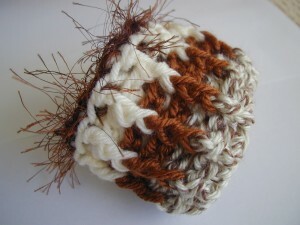 This entry was posted on Friday, February 25th, 2011 at 12:04 PM by Robin Beers	and is filed under Free Crochet Patterns. You can follow any responses to this entry through the RSS 2.0 feed. You can leave a response, or trackback from your own site. I’m sorry, I do not like that at all. I don’t realy like it either..I don’t know anyone who would wear it ..Sorry!! Actually, I like it, not sure about eyelash yarn – but I’ll see when I make it. I personally don’t like it but probably teens would think its cool. Why even comment if you don’t like it? It’s not as if it’s going to be given to you, just move on people. Just use your imagination you can do it in one color or two don’t add the eyelit yarn. You could put another edgeing on. I bet you guys would really like it then. It is a nice pattern with a ton of variations. Thanks, Terry, I try not to take the negative comments personally. Ronnie, I was just thinking, you could use a lighter weight yarn too and even crochet thread in a size 3 that would make it a different feel altogether! Maybe those teens would like that! Actually, my mother, who is in her seventies, loves this cuff! I made her one and she got lots of complements at her ceramics class! It would be really pretty around -Christmas = red with white eyelash yarn, and I can picture a red hat with white border/trim in eyelash yarn. Thanks for the pattern, Robin. I would definitely put the eyelash yarn on this cuff. It’s too bad you have to have thick skin to write free crochet patterns! I like the cuff too. It’s earthy and unique! I plan to make a variation for my dad for father’s day. Thank you for the wonderful pattern! I loved this pattern. I was looking for something to use as a cozy but after the drink was gone would be converted into a wristband. *smiling Its Perfect! Thanks for the base pattern that I twisted into a new idea. Patricia is right, it’s cute. And exactly what I was looking for, a quick easy pattern for a Twiddle Cuff. Thanks.